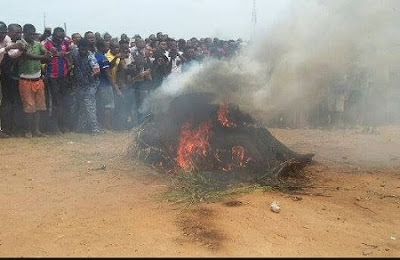 A woman, allegedly found in possession of human parts, was Saturday afternoon set ablaze by a mob around Ekete-Inland area in Udu council area of Delta state. It was gathered that the woman, who was reportedly known to be moving around the area, disguised as a lunatic, was caught with human parts as well as a fresh human corpse at the spot where she stays. According to eyewitnesses, the woman was discovered with the unsightly possessions when residents were disposing off refuse and burning dirt gathered during the day’s environmental sanitation exercise. One of the witnesses, who spoke under conditions of anonymity, said the woman, whom she said had always been seen in the area as a mere lunatic, attracted the attention of some members of the community, who suspected her strange attitude while they were burning refuse close to her shack. “When some of the people who were burning refuse observed she was behaving strangely, they went on to look into her hut and to their surprise, they saw a fresh corpse of a young girl and other human parts. This made the people to raise the alarm and suspecting that she might have been in this sort of business for a very long time, people got angry and seized her”, the source said. The crowd, which grew more and more with time, unleashed their anger on her and before long and before security agents could arrive the scene, the woman, whose name could not be ascertained in the melee, had been set ablaze. Meanwhile, when reached for official comments, the spokesman of the Delta state police command, Andrew Aniamaka (DSP), said he would only be able to comment after getting briefed by the relevant Divisional Police Officer of the area.